Darnell is on her second week of the NBUS challenges, this time the optional themes are Camoflaged Word and/or CASE. I have CASEd my card from a lovely card I've seen on Pinterest numerous times. I love the idea of using the stamens from the die set as a dandelion seed head (had to look that up 'cause I always thought dandelions were yellow flowers like daisies, and they are : ) with bits flying away. I simplified my card by using NBUS patterned paper and a simple sentiment on an oval label. 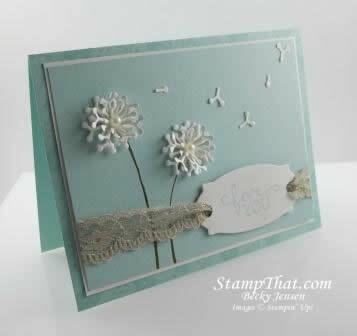 Thank you for joining us at CHNPPC with two gorgeous cards, those dandelion clocks look great.